Long before the ADCO/Grier partnership was formed, Ken Grier incorporated Grier Doors in April 6, 1976 as a 25 year-old with grade 12 education and humble roots, but also with a raging desire to succeed. Grier Doors. supplied and installed doors, frames, metal frames and doors, trim, hardware, shelving, bath accessories and kitchen cabinets. Since the company was founded, Grier Doors completed over 75,000 projects, employing over 200 workers in that timespan. 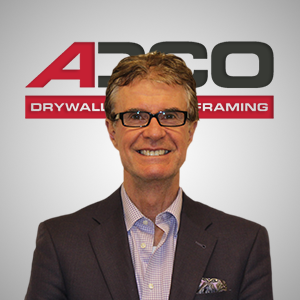 Ken first met ADCO Drywall’s owner, Bob Hurdle, while building Grier Doors. Many years later, during a trip to Sacramento in July of 2011, Ken called Bob to reconnect and see how he was doing. To Ken’s complete surprise, he found out that Bob was closing down his business despite much success. Unbeknownst to Ken was that Bob had sold ADCO Drywall, but as a result of the recession, the company had failed under its new owners. Bob had taken it back and cleared all outstanding payables to maintain the reputation that had been built over 20 years. After learning all this, Ken asked Bob if he would be interested in selling him the ADCO name and consulting for him in the business of drywall and metal framing. Bob agreed, and over the next several months, the two worked out an agreement that gave birth to ADCO/Grier, Inc. and set us on a path to build on 29 years of history. It is truly amazing how ADCO/Grier is growing, both as a company and as a team. Having fully engaged superintendents, foremen, PEs, PMs, accounting and preconstruction working and growing together has truly been a daily encouragement. Who could have imagined the rapid growth we’ve experienced over the past five years that has seen us expand to 350 employees.